Another Millennial or even Gen-Z focused mortgage lender has come online, literally, to offer you a mortgage. I’m talking about Laurel Road, which sounds like a really neat place to get a home loan. They claim to “offer an end-to-end digital experience,” meaning you can go through the entire home loan process without leaving your couch, maybe. The use of technology like data verification and the policy of human interaction only when needed can speed up the loan process and potentially cut costs for the borrower. It’s a pretty common claim these days as up-and-coming disruptors emerge in the space and the old guard scurry to update their stale practices. Let’s learn more about the company to see what they’re all about and if they’re any different than what’s already out there. They are a Darien, Connecticut-based FDIC-insured bank and direct lender formerly known as “Darien Rowayton Bank,” which is the name of two cities near Stamford, CT. They appear to have three physical bank branches in that area of Connecticut, but seem to be making the move primarily to online lender. They offer home loan products in all 50 states, including Washington D.C.
Laurel Road’s online lending division launched a student loan refinancing business back in 2013, and mustered over $3 billion in loan volume since that time. Now they want to do the same thing with home loans, following a path similar to SoFi Mortgage, which offers both products as well. It’s a natural fit seeing that college students often buy homes not too long after they graduate and find a stable job. Anyway, I gave Laurel Road a spin and was impressed with all the information they provided, along with some other neat features. One cool feature to Laurel Road’s mortgage platform is the ability to earn closing cost credit by completing the loan application online. 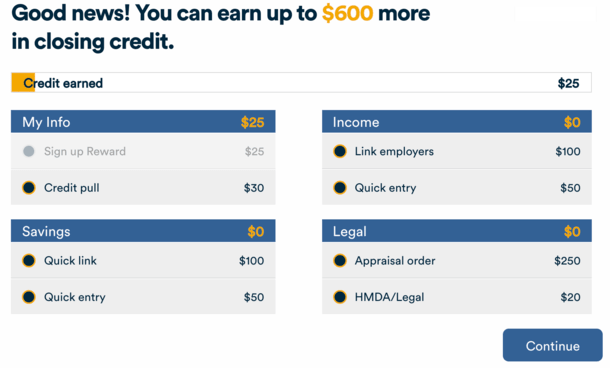 They give you $25 credit just for signing up, then offer an additional $600 in credits if you complete other actions like linking a savings account or employment info, ordering a home appraisal, or generating a credit pull (which is apparently a soft one to avoid any unnecessary credit score dings!). These credits can then be used to offset your closing costs if Laurel Road eventually funds your mortgage. You also get a $350 lender credit toward closing costs if you have an existing lending relationship with Laurel Road, ostensibly a student loan. So it’s possible to earn $1,000 off non-recurring closing costs. Once you fill out a basic loan inquiry form on their website, you can fine-tune it by preference. For example, if you tell them you want the lowest interest rate possible, they’ll give you three options to choose from. If you indicate that your “ownership intention” is only 5-10 years, the most common options seem to be the 5/1 ARM, 7/1 ARM, and 30-year fixed. If you indicate a tenure beyond 10 years, they may show you the 5/1 ARM, 15-year fixed, and 20-year fixed, assuming you want the lowest interest rate. If you want the lowest monthly payment and long tenure, the offerings may change to the 10/1 ARM and 30-year fixed. They also promise to provide real mortgage rates and customized options. And there seems to be a lot of them. What Types of Mortgages Does Laurel Road Offer? Laurel Road offers a variety of different home loans, all of which appear to be conventional loans, those not backed by the government. I’ve been told that they originate FHA loans and also offer VA loans, but when I played with their loan comparison tool all I could see was a minimum down payment of 5%. So if you’re looking for a home loan product with no down payment or just 3.5% down, you might have to call in to Laurel Road instead. However, they have a wide range of loan options, including 30-year, 20-year, 15-year, and 10-year fixed loans. And 5, 7, and 10/1 ARMs. Nothing too groundbreaking or unique, but still all the usual stuff you would expect and perhaps a bit more. All in all, their mortgage rates and fees seemed pretty competitive, and they go into great detail regarding all that is charged. You can see a full breakdown of estimated costs when comparing options. Too Much Choice, Not Enough Speed? The one negative is that there are almost too many possible combinations in terms of loan options, with different rates and fees thrown out each time you adjust one preference. You could seemingly tinker with the options for an hour and see all types of different stuff, at which point you’d maybe want to just pick up the phone and call them and ask for something specific. That’s my main gripe with Laurel Road – I wish it was faster and easier to just move things around and see new rates and fees on the fly, without having to refresh the page each time and wait to see what it comes up with. Other than that, assuming they actually live up to their promise of getting you a mortgage entirely online, they could be a good choice if their rate and fees are competitive. For someone who isn’t interested in much human support, which is apparently Millennials and perhaps Generation Z, they could be worth checking out. After all, more shopping around tends to lead to a better-priced mortgage, and additional competitors vying for your business could yield serious savings. If they make the home loan process easier as well, that’s just the icing on the cake. Lastly, Laurel Road says it does service mortgages, but it may also sell your home loan to a third-party, which is pretty common these days. Update: KeyBank has acquired Laurel Road Bank’s digital lending business, including its student loan and mortgage origination platform.